An off-season sabbatical to the birthplace of the Renaissance is symbolic of Nathan Buckley’s enlightenment. So long defined by his footballing frustrations, many would have predicted a tortured summer for the Pies coach, haunted by visions of Dom Sheed’s sealer and thoughts of what might have been. Instead, a three-month Italian holiday in the wake of a grand final heartbreaker is the latest sign of a man reborn. And yet, it wasn’t so easy to separate Buckley from his one-time discontented footballing bio as the curtain fell on September’s epic decider. The enduring image of the mentor – head in hands as the final siren blared – fit snugly into the tragic Buckley footballing narrative. After all, he had graced this grand stage before. Twice as a Collingwood player – and in spite of his best efforts – Buckley had left the big dance licking his wounds. Would Nat Fyfe and Lachie Neale like to swap spots now? This one promised to be different and, in one fundamental way, it was. Buckley lost again, but he didn’t lose angry. Anger seemingly borne of an unrealised footballing entitlement, for it wasn’t meant to be this way. Buckley’s 1992 coming-out party – featuring a best-on-ground performance in Port Adelaide’s SANFL grand final win and a league best and fairest – should have been the precursor to Buckley’s inevitable AFL coronation. Looking back at photos of the day, a beaming Buckley radiates youthful exuberance. There he was, triumphant with the football world at his feet. And then – after a cameo in Brisbane – he chose to play for Collingwood, the biggest club in the land. The kink in the plan was two-fold. Most obvious was that he joined a declining outfit that robbed him of regular finals football during the first half of his black-and-white stay. But no less galling was that in doing so, he spurned future premiership powerhouses, the Lions and Kangaroos – a fact he was rudely reminded of every time he confronted these all-conquering foes. And we saw less of the smiling Nathan. 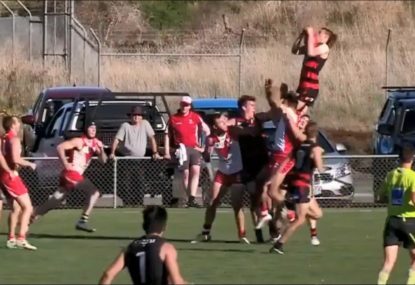 'The Flying Mullet' takes mark of the year contender! Seemingly frustrated by his footballing lot, Buckley exuded coolness. He was hard to embrace, even when the football world was ready to wrap its arms around him. His heroic Norm Smith Medal-winning performance in Collingwood’s agonising grand final loss to the Lions in 2002 is perhaps best remembered for Buckley disdainfully stuffing the medal in his sock. And then his playing career ended just as Collingwood’s golden run began. The awkward Eddie McGuire-orchestrated coaching handover from Mick Malthouse that followed did little to improve Buckley’s demeanour. Collingwood’s consecutive grand final appearances – and 2010 premiership glory – coupled with Malthouse’s messy exit, cast Buckley as gate-crasher. He inherited Malthouse’s team, but not the premiership-fortified love his players felt for his predecessor. Buckley then spent six humbling years in the football wilderness, barely surviving and seldom smiling. He often appeared puzzled by his plight, as if wondering how a game he had long mastered as a player could betray him as a coach. He grew a beard and joked with reporters. He smiled more, a happy smile with just a hint of the beaming young man from that Adelaide premiership dais of yesteryear. The relief of last year’s contract extension – which came at the crossroads – surely played a part in this sunnier disposition. It’s that rare form of enlightenment, borne of confronting one’s own footballing mortality. Humbled but unbroken, Buckley is now free to enjoy because there’s nothing left to fear. In any event, he gets it now, he gets it all. That was plain to see in the uber-natural way he consoled the cheersquad member after the torn banner episode, and then the errant Collingwood runner on grand final day. And now, this extended off-season European vacation. Not only that, but his team is good and getting better. Having run out of it as a player and so nearly during his first incarnation as coach, time is finally on Buckley’s side – a magical 2018 season has ensured that. Most importantly, the players love him, just like their predecessors loved Malthouse. One only need hear Travis Varcoe tell SEN, “If you wanted to be like someone, that’s where you want to head” to appreciate the depth of feeling for the Pies coach within the dressing room. It would be wrong to say in Buckley’s case that it’s now more about the journey than the destination. For a premiership would be more fulfilling now than had it arrived as the divine footballing right it once seemed. But the journey is certainly far richer for Buckley’s renaissance. 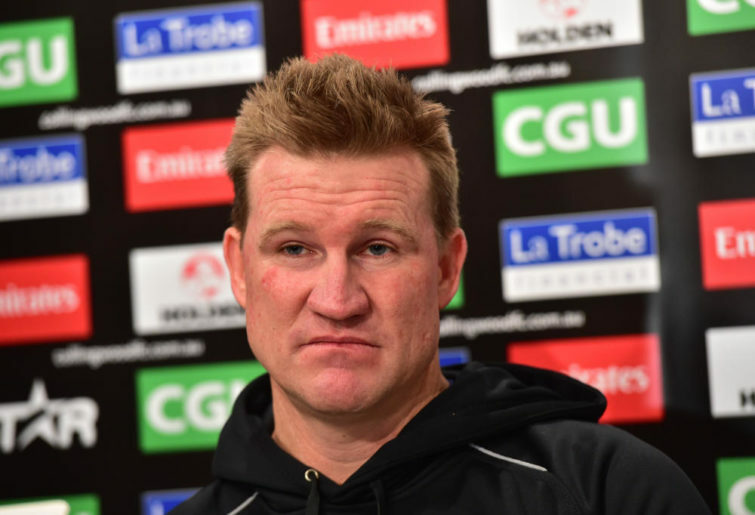 Nathan Buckley remains forever Collingwood, but no longer just black and white.